A Day in the Village – Run. Ride. Roam. Well, the weather forecast was right and today it rained…and rained…and rained. We sat in the tent as the clouds opened around us and the wind blew and buffeted the little tent around with ferocious gusts. It withstood the pounding though and we stayed dry within the shelter of its flapping walls. We got some laundry done, while the weather played its games and then decided to take a break from the tent and stroll into the village and seek shelter in a tea room. 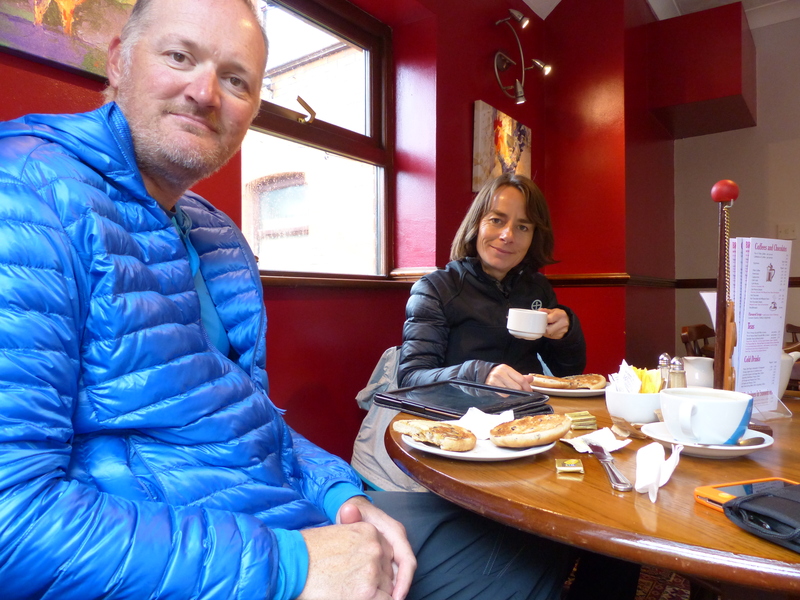 We headed to the lovely little place where we had enjoyed crumpets and toasted tea cakes yesterday and again enjoyed a delightful elevenses. We also took the opportunity to use their free wifi and managed to make a start on some overdue blog posts, while drinking pots of tea, cups of coffee and staying on to enjoy lunch, just so we had a reason to hog our little table in the corner. It was a tough price to pay! After two hours of their hospitality we decided we may be on the cusp of outstaying our welcome, so we decided to move on! The rain had eased so we walked around the village to search for some necessaries at a camping shop and hardware store. It was so nice, just being part of this small, charming village, strolling around and experiencing village life. As we walked up the street, we looked at a lovely white stone cottage, with shiny black door and pebble driveway and what do you think we saw on the doorstep? A pony! Yep, it had just strolled up the driveway and was standing at the door. On seeing us, it slowly and lethargically turned around, walked towards us, paused briefly and then dawdled across the road and continued ambling up the middle of the street! 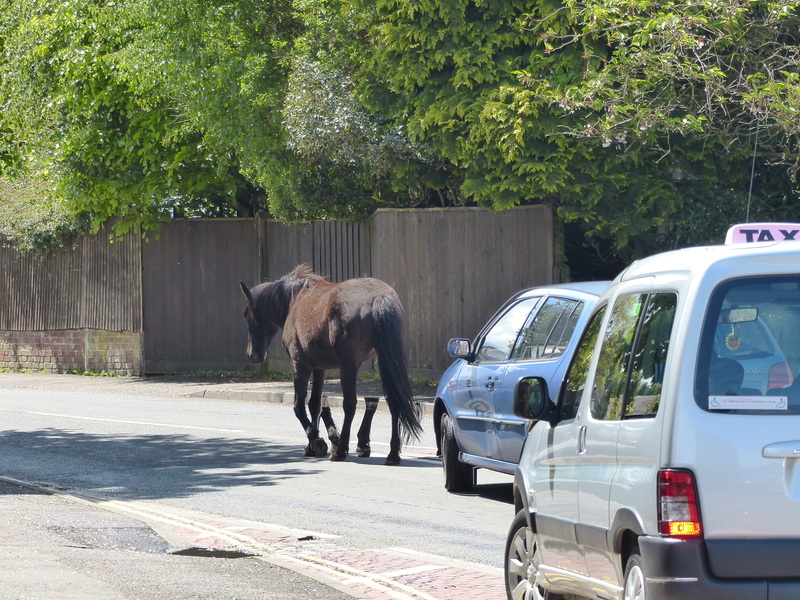 Cars drove in behind it and slowed to a crawl as the pony just plodded in its own leisurely time, up the street. How gorgeous! We still had a bit of blogging to finish off, so decided to head for one of the village pubs, find a snug and once again, make use of the free wifi on offer. We positioned ourselves in the corner, I once again downed a pot of tea (feeling somewhat waterlogged at this point after already having two full pots all to myself at the tea rooms!) and Steve had his first pint of lager in an English pub. We typed furiously and finally managed to hit the ‘Publish’ button and the blog, thanks to village wifi and the supreme elasticity of our bellies and bladders, was finally up to date! 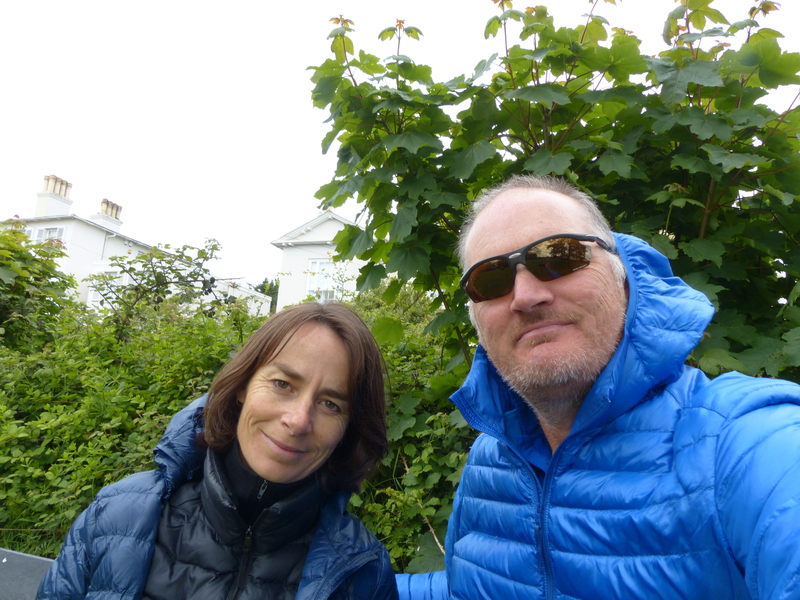 We left the little pub and walked out the door into…sunshine! The rain had finally passed completely and the village sparkled in the sunlight. I strolled to the village greengrocer to get a couple of things and then we began the pleasant walk back to our camp in the forest, where we found our little tent still standing and our bikes where we left them without mishap or dents from hoof prints. The ponies were grazing around our pitch and we sat in the tent and road tested our newly purchased camping toaster…yay…toast!! 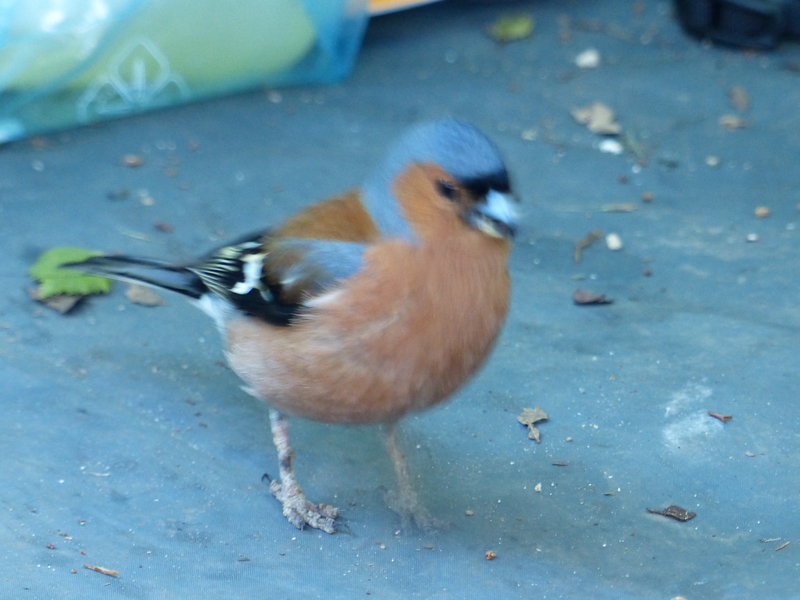 Then we chatted to our little visitor, who has been popping in every now and again…a little robin. It flies down, hops around outside the tent and tonight, it hopped into the tent to pick up some stray toast crumbs. It’s a friendly little fellow and has no worries about just popping in for a visit or standing near our chairs and watching us, while all his other birdy pals cheep and twitter in the branches above us. What a delightful day! Yes, the weather was very ordinary to start with, but what fun it was to just be in the village, to be able to walk in, sit in a tea room, stroll around, sit in the pub and stroll back again. I have wanted to do that for so long…just enjoy a pause in a little village. Perfect! Tomorrow’s weather is supposed to be even worse…more rain, wind, hail and the possibility of a thunderstorm! Oh England, you really do turn it on for us don’t you! I guess it’s no more or less than Spain, Portugal and France gave us, so we forgive you, you’re just following the crowd! With weather like that, we think we’ll be staying in the forest for another day, rather than ride through hail and thunderstorms! We’ll do some more exploring in the rain and maybe catch a train to another town or village and see what tea rooms or pubs we can find! All I can say is…I’m absolutely loving it! LOVE-ING…IT!! I love being in the forest, I love seeing the wildlife and being nestled in the oak trees, I love the quiet villages and the friendly people, who invariably have a smile and a “Hiya” and sometimes a “darlin’” thrown into a sentence. Village life is the life for me! With the weather again forecast to crack up, we extended our stay in the forest and took ourselves on an outing to Lymington to sit out the rain and hail. 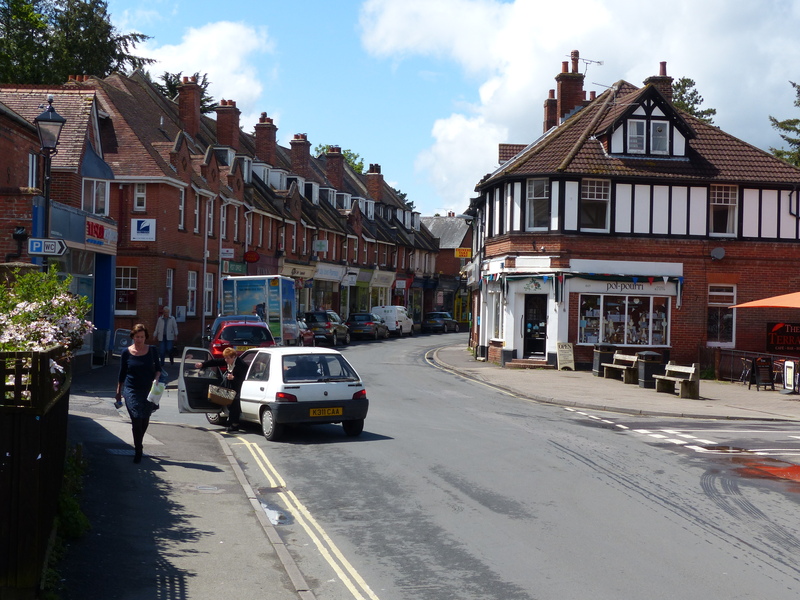 We strolled into the village of Brockenhurst and up to the train station where we were in time to catch the next service to Lymington. It was a shame the trip was such a short one because it was a very nice train! We sat on the soft, comfy seats with our table and watched the New Forest and countryside pass by the window. 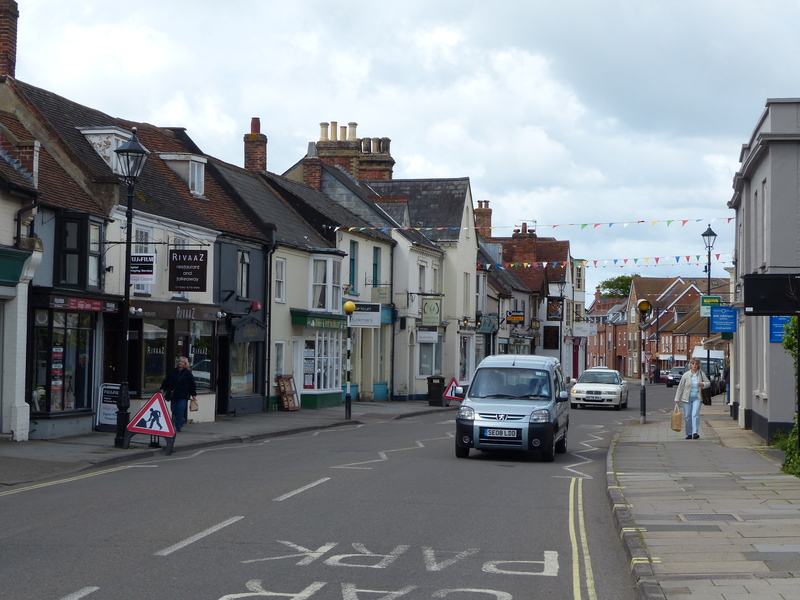 In a mere ten minutes we were at Lymington town centre and we strolled up the hill to see yet another lovely little village. We walked up the High Street, stopping in a bookstore to buy a map for our ongoing journey and then leisurely strolled around the town, watching the black clouds approaching while the wind became chillier. We stopped in a small park to have elevenses and just as we were about to sit down, down came the rain! We turned tail and walked back down the street, trying to find a spot to sit and shelter. This turned out to be under the arch of a car park! Not the most scenic of venues for elevenses but it was dry! It was really nice to just stroll around this little town and I could imagine it in the 40’s, with ladies in their hats and dresses pushing prams up the street and gentleman in their hats and suits walking past the shopfronts. Yes, there was obviously modern amenities and chain stores and so on, but the look of the town was still very much a picture of years gone by. It was charming. Oh, and it did hail! I guess we made the right decision to stay and not ride on because it was cold and wet and windy and hailing. Our tent was still standing when we returned though. Tough little thing! Brrrrrrr, it was a cold one this morning! I was up at 4:30 and wandered over to the bathroom block to get dressed in a little bit of warmth, then snuck back into the tent and waited for Steve to join the land of the conscious. A couple of hours later I heard the muttered words, “It feels too cold to get up.” Arise he eventually did and it was cold! 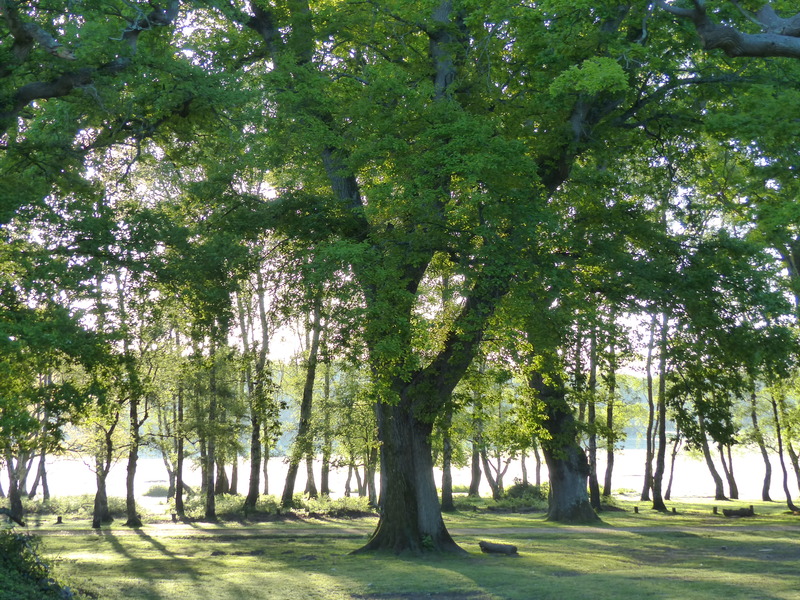 Despite that, it was lovely to sit and watch the sun come up through the trees as we had breakfast. Sadly, today was the day to say goodbye to our forest home and ride on. We were packed up nice and early, but moved the tent into a sunny spot and then just sat and waited for a while for it to dry out enough to pack. Then…we were off again! We were heading towards Bournemouth, following the National Cycling Network route and I have to say, today was one of the nicest, most enjoyable rides so far. 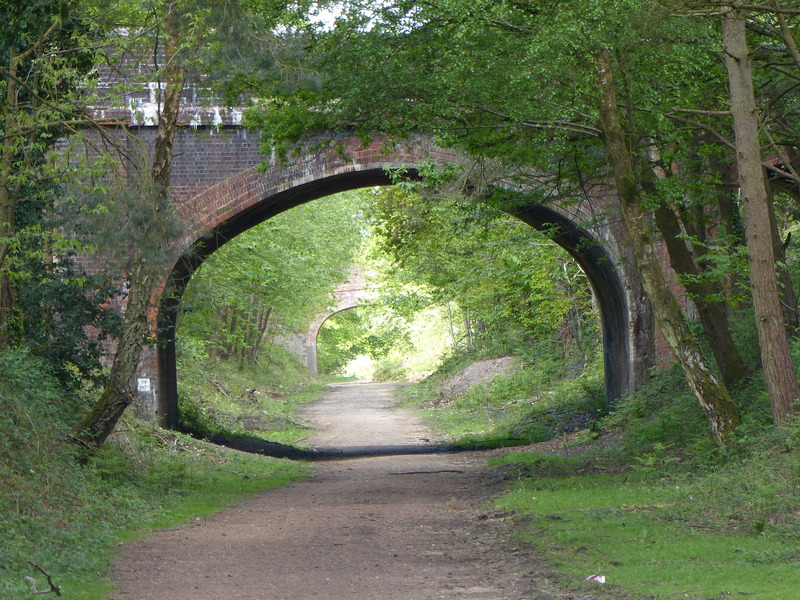 The route began along an old, one-time railway line, through the New Forest and under the old railway arches. We passed groups of ponies and a very newborn foal, tottering along beside mum. We also passed a lot of walkers with their dogs. We have noticed something very different about the dogs here in England. We pass a lot of them each day we ride and guess what…? None of them shout at us! So far, not a single dog, of any shape, size or breed has paid us the slightest bit of attention. In our other three countries all the dogs were either angry, growling, snarling beasts, or at the very least, they barked at us or chased us and even the little docile looking ones, turned from a lamb to a werewolf the second we road past. Here though, they all just continue sniffing along or bounding about with smiles on their faces, or just ignoring us completely. What a pleasant change! 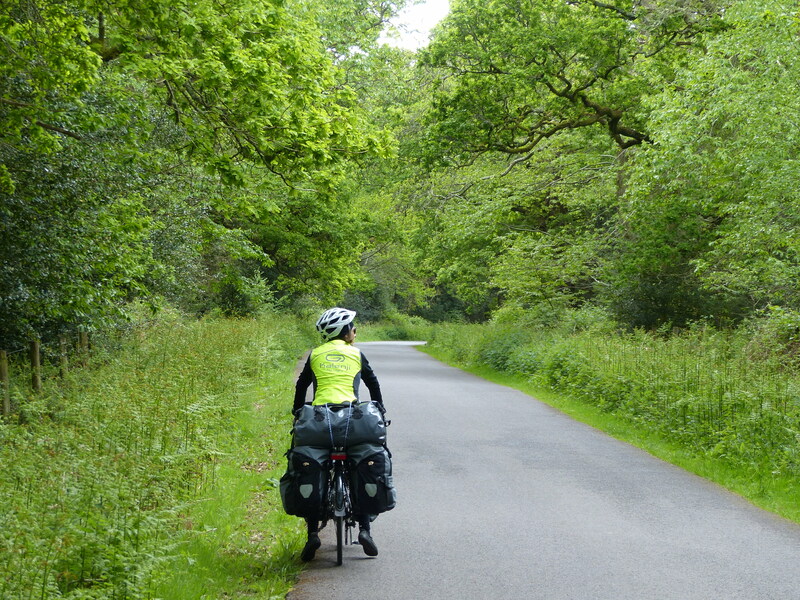 We continued along our beautiful route, along country roads flanked by hedgerows, bike paths through canopies of trees, through small towns, splashing through fords (thankfully shallow!) and up some hills that were just enough to quicken the breathing and give the range of gears a reminder to wake up. We stopped in the town of Mudeford for elevenses and found a picnic table beside the Community Centre. We went inside to ask the man in the office if it would be OK for us to use their toilet, to which he was most obliging.The ladies’ loo was full of the local playgroup doing their mass toilet stop, before going outside for their walk and play, so I waited in line behind the three years olds and listened to the little tackers chat and laugh and their carers efficiently doling out liquid soap and directing traffic to the hand dryers. I know what it’s like to get a group of kiddies through that process and this group worked like a well oiled machine! We sat outside at the table, with the morning turning chillier, at just 10C and a chill wind, but it was nice to just sit and watch the people playing tennis and then the playgroup running around the small playground. Just as we were about to leave, the man from the office came out and chatted to us, asking where we’d come from and where we were heading. We told him about our trip so far and he thought it was marvellous. He told us about his dream trip, that he has just started researching and that is to canoe the waterways of the UK. He said there are thousands of miles of canals and waterways throughout the country and paddling around them is his grand plan. It sounded fantastic! After a very pleasant chat (I love the chattiness of the people we are coming across, I just love it! ), we pedalled off along the bike path. We again rode along quiet country roads, passed quaint houses and thatched cottages and even a solar farm! Now come on Australia, what’s the hold up!? Yes, I know we do have solar power plants, but really, why aren’t we capitalising even more on this? If England, with its inclement weather and not terribly consistent sunshine, is optimistic enough to install a solar farm in Dorset, where’s our can-do attitude? Short sighted, coal loving governments don’t help, but when we rode past this solar farm, set in the Dorset countryside, we both commented that we are from a country that has a whole lot of space with a whole lot of sun and we just don’t seem to be using it enough! That solar farm in the English countryside was a shining example of the best of British optimism! 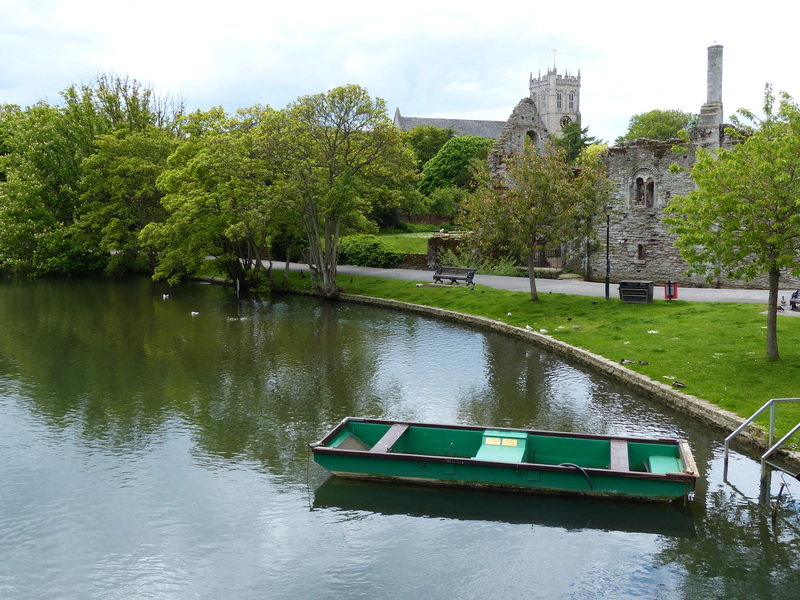 We rode into the town of Christchurch and it seemed that Christchurch in New Zealand may have modelled itself on its namesake, because there were distinct similarities, with the canal running through the town and the cathedral nearby. 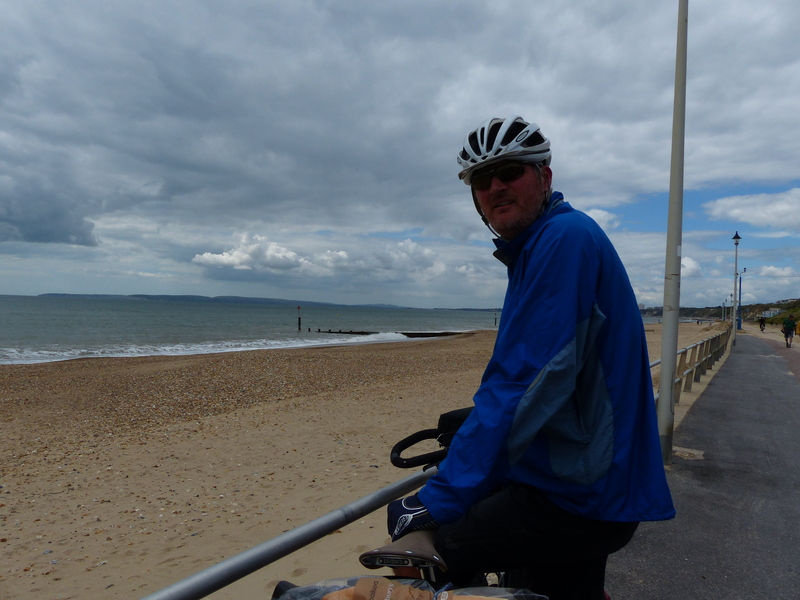 We rode beside the canal, greeting passing walkers and cyclists with a cheery “Good morning” or “G’day” and then the path took us along the coast and into the outskirts of Bournemouth. As we neared Bournemouth we came across a sign with a decision to make. One sign pointed in one direction and said, ‘Town Centre and Poole via Seafront’ and the other sign pointed in a different direction and said, ‘Town Centre and Poole via Cliff Top’. Hmmmmm, what to do? Which way should we go? Decisions, decisions! Yes, you guessed right, we happily turned left, away from the cliff top option and pedalled along the wide esplanade beside the seafront. The sky was grey, the day was chilly and the wind was cold, but this had not deterred the stoic locals from enjoying their beach! As we pedalled along, with some swerving through the thick sand drifts that piled up along the path, we marvelled at the spirit of the folks enjoying their time at the seaside. It wasn’t just children either, we saw a middle aged couple, just them, together, with their spades and buckets digging in the sand and creating tunnels and castles. How gorgeous! Not only that but the lady was in shorts and a blouse! That’s the spirit! We found a sheltered bench at the pier and sat out of the wind to have some lunch and decide on our forward progress. Steve has come up with a new plan for our daily rides, while we are here in the UK. We don’t have any set plans, deadlines or destinations, so the new plan is to ride until about 2:00 and then find the nearest campsite and stop wherever we happen to be. We had thought today we may ride on to Swanage, taking the chain ferry from Poole. It was now 1:30, so as we had lunch, we did some research about nearby camps, while both of us put on some more layers to try and ward off the cold and discussed whether we ride on or find somewhere close by. As it turned out, there were no campsites within 20km that took tents and we were both feeling the cold, so in the end we found a hotel in Bournemouth that was the same price as a campsite, so that became our destination. The decision was also partly made for the fact that all our devices, phones, iPads, computer were flat after a few days in the forest with no power supply. The discreet and short recharge at our corner table in the tea room in Brockenhurst had given us a little bit of battery life, but we really needed to charge everything and also hopefully find some wifi. So the cheap and cheerful hotel seemed the best choice. It happened to be at the top of a very steep street, so we did finally warm up for the last few hundred metres as we puffed and pedalled up a mighty incline! The man at the hotel was happy to store the bikes and the room is very nice, although somewhat quirky! There is a kettle and tea and coffee in the room, but no powerpoint to plug it in! The only power is a power board behind the bed. So we have pulled the bed out, stretched behind it and plugged in our devices to charge. The kettle, with its short cord, is sitting on the floor behind the bed! I have to do a bit of a gymnastic manoeuvre to stretch behind the bed to put it on and pick it up each time we make a cuppa! Love it! After a nice hot shower to thaw out, we went for an explore around the centre of Bournemouth. I was pleasantly surprised. Being the holiday-makers’ mecca that it is, I was expecting it to be a little brash, big and busy, but it wasn’t at all. It’s a bank holiday on Monday, so maybe it will be a bit different over the long weekend when it fills up with out-of-towners, but today it was just a nice, pleasant town. We found some suitable supper for a hotel room in the form of a Marks and Spencer salad, then stopped at Tesco for some extras that we couldn’t find at M&S and then headed back to our little room. I saw a sign at a Tesco, that was a bit of a head-shaker. In the cereal aisle there was a sign for one side of the aisle that said “Healthy Cereals” and a sign for the other side of the aisle that said “Children’s Cereals”. Obviously it’s thought that those two things can not be one and the same! Needless to say the “children’s cereals” were the sugar laden boxes of rubbish containing every possible number, additive and preservative ever concocted in a science laboratory. I just shook my head, that those two signs were hanging there side by side, so obviously advertising the fact that children are being fed something other than “healthy”. Something has surely gone amiss somewhere! So far, those words just sum up our English experience! It’s only been a short time and who knows what the next few months will throw at us, but for now…LOVE IT! You’re Not a Bike Warden Are You?